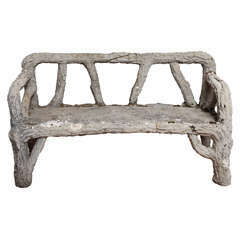 Cement squirrel base bench in a weathered finish, circa late 20th century. Contemporary iron base garden table with a slate top in a weathered finish. 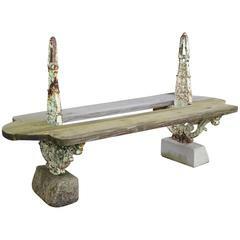 Glass top garden table with a metal dolphin base in a weathered finish, circa mid-20th century. Brass Asian style garden seat with etched Chinese nature scenes, circa mid-20th century. Vintage ceramic whimsical garden seat in a shape of an elephant with decorative floral pattern work. 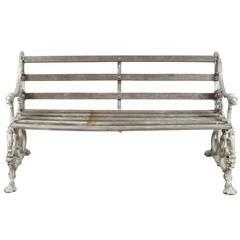 Unusual cast aluminum garden bench. Each side is done as a curving snake. 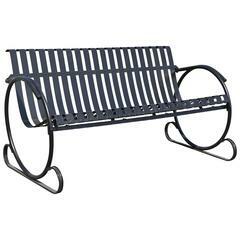 Stylish deco style metal outdoor or porch bench in steel includes seating for three attached to circular arms and feet. Newly sandblasted and primed in black. 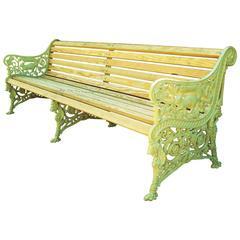 Arm height: 25 "
Vintage green and white slatted garden bench from the 19th Century. 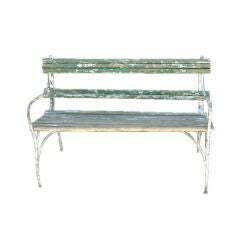 Wooded bench has a beautiful patina and graceful metal arms and legs. Vintage condition. 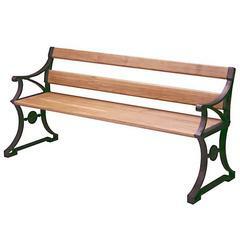 A very unusual size faux bois garden bench.